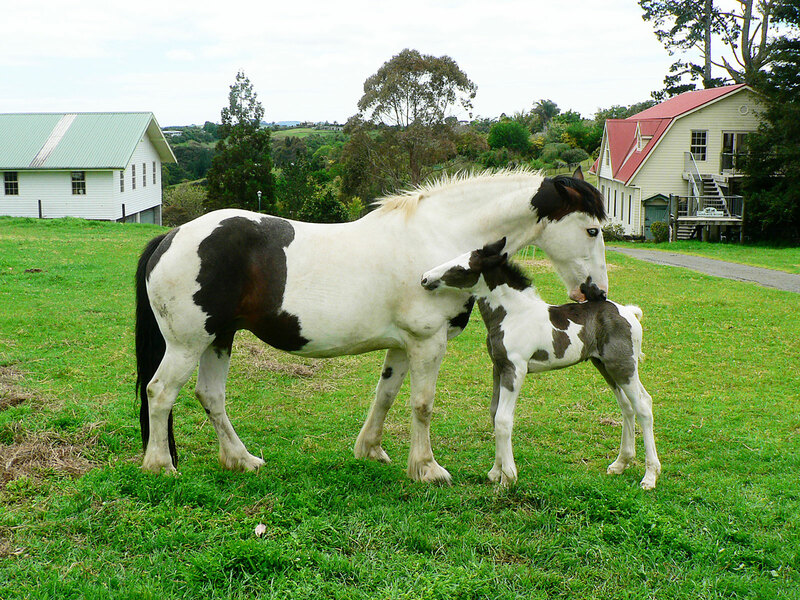 Come to our self catering farmstay in the warm Bay of Islands New Zealand on a waterfront horse breeding farm. Our horses work daily pulling vintage wagons, drays and gigs. The 25 acre property grazes Clydesdale and Shire Heavy Horses and also some Piebald Gypsy Vanners. The self-catering accommodation is in The Carriage House, offering sole occupancy for 2 – 4 persons in a self contained cottage with two bedrooms. A large comfortable living room with well appointed kitchen and all appliances ensure a comfortable stay. You have the choice of staying at a weekly rental or a rate per day (minimum 2 nights). There is a rate for 2 and a rate for 4 people. Rates and bookings for The Carriage House accommodation. 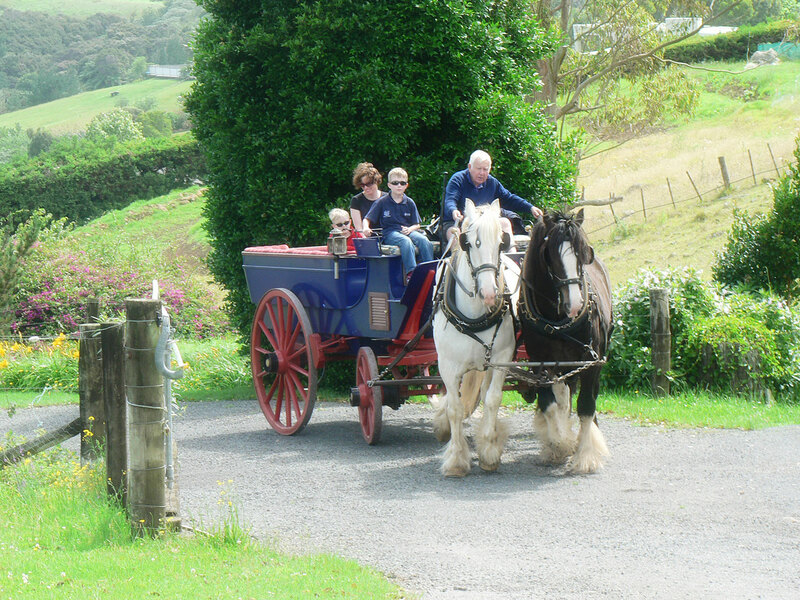 There is plenty of interest on the farm, in Kerikeri, and exploring the Bay of Islands. The Grey Shire Horses formerly worked for the LION BREWERY in NZ and we have the Brewers Dray built in 1886. Shire Horses are an endangered species and we are the only breeders of the rare Grey Shires in the southern hemisphere. Some are 18-19 Hands and when 5 years old they turn white. We have nine trained to pull waggons. Clydesdale horses of 16-17 hands are the Scottish Heavy Horses and they pull a New Zealand Settlers Waggon or an 1880 Adelaide Express. Even more interesting is the Gypsy Bow Waggon, a horse drawn caravan all beautifully carved and brightly painted. We are breeding black and white Irish Draft Gypsy horses to pull this as a Gypsy would. These are called Piebald when black and white. Even if you are not a horse person you can get away from the crowds and enjoy the open spaces of a small farm in a waterfront location with views of the boats on the Kerikeri Inlet, Bay of Islands. 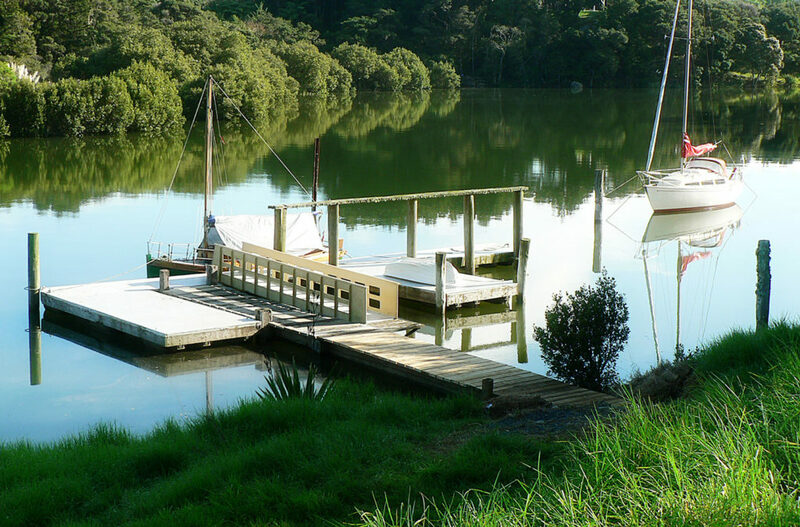 Bring your kayak and explore the Kerikeri Inlet from our jetty!